ISA proudly publishes six journals (ISQ, ISR, IPS, FPA, ISP and JoGSS) and co-sponsors a seventh (II). As an ISA member, you may download, search, copy, print and save single copies of individual articles, chapters or entries in our journals for your own personal use, including your scholarly, educational or scientific research. Online access to the journals is free for ISA members. Print copies are available for an additional fee with your membership. The ISA has joined together with Oxford University Press to revitalize the International Studies Encyclopedia as part of Oxford’s Research Encyclopedias program. 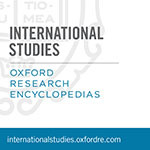 The complete Encyclopedia of International Studies is now available along with new and revised articles as the Oxford Research Encyclopedia (ORE) of International Studies. Editor in Chief Renée Marlin-Bennett and a team of academic advisors are overseeing the commissioning and ongoing publication of new content. 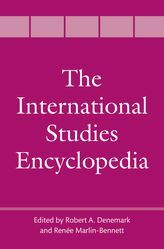 The Encyclopedia of International Studies (formerly the ISA Compendium Project) is designed as a fundamental resource for International Studies. It comprises peer reviewed essays that assess the intellectual history of scholarship on topics of International Studies. Rigorous, comprehensive, and neutral in tone, the essays detail fruitful lines of research up to the current “state of the art” and describe prior dead-ends. The Encyclopedia is available online for all ISA members and can also be purchased directly through Oxford University Press. The original Encyclopedia plus new and revised articles are available as part of an ongoing copublication project, the Oxford Research Encyclopedia of International Studies. Each of ISA's journals, as well as the Encyclopedia, are managed by their own editorial team. Broad governance of publications happens through the Publications Committee.